Sensibio H2O gently cleanses and removes make-up from face and eyes. The micelles contained in its formula effectively micro-emulsify impurities while maintaining the skin’s balance. Availability: Selected retail stores nationwide. I wear make-up just about every day of my life, and if there’s one thing I hate, it’s when a make-up remover doesn’t do its job properly. 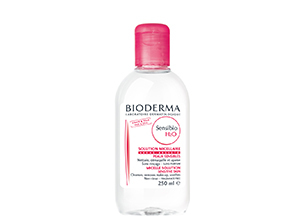 I always make sure my skin is thoroughly cleansed before applying my serum and night cream; this make-up remover from Bioderma made the job easy. I’m used to a milky make-up remover, so the consistency of this product was new to me. Clear and runny, the formulation worked beautifully. I was able to remove my eye make-up gently and easily – there was no rubbing required. Plus, I found it soothing and non-irritating (it’s fragrance-free, so even those of us with sensitive eyes can use it). Not only did it get the job done perfectly, but it was highly effective too – I saved so much time as one or two light sweeps was all that was required. The original micellar water, and absolutely effective….it replaces your waterproof eye makeup and lipstick remover as well as your usual make up remover and your cleanser and toner. Apply some to a cotton pad and even long wearing formulations lift off easily without significant rubbing or skin irritation. this product is literally the best makeup remover around, it leaves your face feeling fresh and moisturized, it actually feels like silk and is so gentle on the eyes, that it doesnt leave any irritation. it simply removes all your makeup, even the waterproof mascaras that we dread to take out. my mum, sister and I are big fans of this product and would highly recommend it! I have to give this product a 5/5! After seeing a well-known makeup artist showcasing the product and reading rave reviews from other mere mortals like me, I decided to give it a whirl. One of the great things about this product is the fact that you can do a lot with little. Just take two cotton pads with a bit of Bioderma on them, place them over your (closed!) eyes and wait a few seconds. Gently slide the pad away and you will see that the makeup just slides off. I wear waterproof mascara all the time (cannot live without it) and Bioderma has been the only thing that gets all of it off at the end of the day without lots of rubbing or a mountain of cotton pads. I have used makeup wipes before but they usually end up drying out my skin and I have to use a lot before the makeup comes off completely (and then there is usually a bit left). With Bioderma I don’t feel like I have to go slather on moisturizer after using it. It also feels super gentle on my skin. I firmly believe it must be because there is no alcohol in the product (most makeup wipes have alcohol in them and tend to leave a burning sensation on the skin). Unfortunately, it is a product that is not easy to find so stock up if you like it! I would definitely recommend that women of all skin types try Bioderma at least once, you won’t be disappointed. Especially if you tend to have a more sensitive skin type (like me), this product will help alleviate any irritation and redness that other removers usually leave. No more rubbing your skin raw (which you know creates wrinkly skin!) with rough makeup wipes and no more getting only half of the makeup residue off! This has to be one of the most featured make-up removers on the net. I love the idea of using is as a pre-cleanse rather than just an eye make-up remover. I will give it a try to see if it can compare to my Dermalogica Precleanse in terms of make-up removal and nourishment. Bioderma makes fantastic products, including their sunscreens (I personally love the AKN Matte Spf 30 which doesn’s cause oiliness and works great under make-up). BioDerma is the bee’s knees, baby! Words cannot express how much I love BioDerma. This make-up remover removes EVERYTHING and leaves a moisturising film on your skin afterwards. The product doesn’t pull on your skin and is gentle enough that it won’t cause any breakouts or other nasties. It isn’t particularly fragranced so it won’t irritate sensitive skin. Just a word of warning though, if you get this in your mouth by accident, it tastes horrible so just be careful when cleansing. I never really understood all the hype about this product until I tried it for myself. I use it as a pre-cleanse and make-up remover before I use my foaming cleanser. It really does a great job. What I love most is the fact that it is super gentle on my sensitive skin and it doesn’t leave any residue after use. It truly feels like water. My skin has improved since adding this product to my skin care regime. I also love the plain and simple packaging and the price isn’t too high. I highly recommend this cleanser.